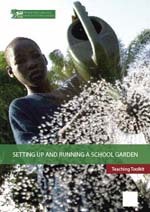 The Teaching Toolkit was prepared by the Nutrition Education and Consumer Awareness Group of the Nutrition and Consumer Protection Division in consultation with the Horticultural Crops Group of the Plant Production and Protection Division in FAO. Ellen Muehlhoff of the Nutrition Education and Consumer Awareness Group, Nutrition and Consumer Protection Division, had overall responsibility for developing and guiding the preparation of this publication. She also served as technical editor. Jane Sherman is the main author of this text. Hitomi Sato of the Horticultural Crops Group reviewed and ensured the technical accuracy of the horticultural lessons. Mel Futter was responsible for the illustrations and photos, and the overall design and layout were carried out by Frédéric Loward. A1 Shall we have a garden? D5 What shall we grow to eat?